The Yes Tourism Tobago car rental service has long been 'the' preferred choice with our holiday enthusiasts. We have even simplified the booking process by offering Tobago's first online reservation service. You can now book a vehicle from the comfort of your home or office, well in advance of your visit - at absolutely no extra cost – and any additional support provided by Yes Tourism. We offer the widest and newest range of rental cars, jeeps and minibuses; but more importantly only source vehicles from the most reputable and reliable rental agencies on Tobago; while monitoring their performance throughout. Tobago is an amazingly picturesque island to explore in a self-drive hire car. However, the island has some remote areas with minimal access to public telephones, so a reliable vehicle is a must! With Yes Tourism behind your reservation, you can be assured of the very best car rental service available. Click on the Frequently Asked Questions (FAQ) tab, above, to see details of insurance, collision damage waiver (CDW), children's car seats and other questions that you might have. Then, click on the 'Cars' tab to see our rates for saloon/sedan cars, 'Jeeps' for 4-wheel-drive 'jeeps' and SUVs, or 'Minivans' for larger vehicles such as station wagons and mini-vans. When you've chosen a vehicle, simply click on the 'Book Now!' button and complete our online car rental reservation form. We will complete the Hire Agreement on your behalf, ensuring a rapid no-fuss handover - you simply sign the Agreement, arrange the payment method and drive away. Please read the Terms & Conditions of the rental agency concerned. Rates are quoted in US Dollars and are inclusive of mileage charges and local taxes. All vehicles are air-conditioned and have automatic transmission, unless stated. The Reference Number in the last column will help you to identify your preferred vehicle on the Booking Form. Please complete the reservation form as fully as possible as this will enable us to complete the Hire Agreement on your behalf, providing a quicker vehicle hand-over when you arrive in Tobago. Submission of the above reservation form implies that you have read and accept the Terms & Conditions available through the FAQ tab at the top of this page. After submitting your booking, we will make arrangements with the agency concerned and confirm your booking by email, just as soon as possible. Neither KCNN, KJ or Sheppy's have any restrictions or additional charges for additional drivers. Rodriguez Car Rental apply an additional driver charge of US$5 per day for each driver other than the hirer and spouse. All of our rental agencies can provide child seats at a rate of US$5 per day per seat (inclusive of all taxes). All agencies offer car seats suitable for infants and children for up to 7 years old. If the vehicle or any of its parts of accessories are damaged while on rental, CDW limits your liability (assuming that you have complied with all the terms of the Rental Agreement). Different rental firms offer different levels of basic insurance cover and CDW, making direct comparison of total price/benefit difficult. Please read KCNN's Terms & Conditions detailed on the page below. Vehicles rented from K.J.Car Rental are subject to an excess of US$1,500 if no CDW is taken. Vehicles rented from Sheppy's Auto Rental are subject to a maximum hirer liability of TT$10,000 (US$1650/£1000/€1250) for cars and TT$15,000 (US$2500/£1500/€1875) for jeeps and vans. Sheppy offers CDW protection on cars limiting liability to TT$5000 (US$840/£500/€625) at an additional cost of US$10 per day (for Jimny Jeeps US$15 per day), or CDW with NO excess at US$20 per day (US$30 per day for Jimny jeeps). CDW protection on the 8-seater Nissan Serena is US$20 and $US40 per day). The new Suzuki Vitara 1.6 and 2.0 also carries a surcharge, with Basic CDW costing US$20 per day and Full CDW costing US$40 per day. Please read Sheppy's Terms & Conditions detailed on the page below. Rodriguez offer two CDW options (Rodriguez refer to CDW as PDW - Physical Damage Waiver). Basic CDW cost US$10 / $US15 / $US20 per day * and limits your liability to just US$ 1500. Rodriguez's Full CDW costs US$20 / US$30 / US$40 per day * and limits liability to US$500. If you do not accept either CDW option from Rodriguez, you will be totally liable for all recovery and repair costs if the vehicle is stolen, lost or damaged. For your own peace of mind, we strongly recommend that you opt for the full CDW option. If not, please ensure that you have read and understand section 5 of Rodriguez's Terms & Conditions detailed on the page below. * Rodriguez's minivans and SUV's are an additional US$5 per day for all Basic CDW and US$10 per day for full CDW rates. The Nissan Urvan Micro Bus carries a supplement of US$10 per over normal CDW rates and an additional US$20 for full CDW . You may either collect your rental vehicle from the rental agency office, on arrival on the island (or at any other time) or have it delivered to your hotel or villa. We will obviously do our very best to deliver the vehicle at the time specified by you on the reservation form. The rental agencies offer free delivery and collection of vehicles throughout the popular areas of Tobago. They do, however, reserve the right to apply a charge for collection and delivery on short term rentals to addresses in outlying villages such as Castara, Charlotteville and Speyside. The minimum driver age is 25. All driver's must have had at least two years driving experience. You will be asked to produce your full national driving licence on delivery of the rental car. It is essential that everyone who wishes to drive the rental vehicle remembers to bring their licence and all additional drivers must be declared on the rental Hire Agreement. Do not rely solely on an International Driving Permit (IDP). The rental rates quoted do NOT include Collision Damage Waiver (CDW). When considering the price of rental, please bear in mind the liabilities shown under "No CDW" in the following table. For your own protection, please see the section above entitled 'Collision Damage Waiver (CDW)'. The figures below are in US$. Payment can be made by VISA and Mastercard credit cards and will be in local currency TT$. Rodriguez Car Rentals also accepts AMEX credit cards which will be charged in US$. Minor variations between the price we quote and the final chanrge may occur due to currency fluctuations. When paying with cash, a security deposit might apply; please enquire with us. All rates are quoted in US Dollars and are fully inclusive of mileage charges and all local taxes. If you have a specific requirement for a make or type of vehicle not, or would like to consider options from any other rental agency, please email us. We have links with most rental agencies on Tobago and will gladly advise you. Your choice of vehicle will obviously be largely dependent upon personal preference and budget. You may, however, wish to bear the following points in mind when choosing a vehicle. Tobago's roads are narrow, twisty, hilly and of variable quality. Small cars and 'Jeep'-type vehicles are particularly appropriate. Open topped vehicles are ideal for all-round visibility and to make the most of the cooling breezes, but liberal and frequent use of sunscreen is essential if you are not to ruin your holiday. Convertible 4WD jeeps are fun, but obviously less secure. Do not leave cameras, video cameras and other valuables in these vehicles, even with the top up. You are unlikely to ever require true 4WD drive (driving a rental vehicle anywhere that requires this facility could compromise your CDW). The rental fleets on Tobago are extremely small by North American and European standards. In some cases, the rental firm may only have one or two examples of specific models. Early reservation is essential and we strongly recommend that you list at least one or two alternative models, in order of preference. Petrol (gas) is cheap on Tobago. The normal procedure is to return the vehicle at the end of the hire with the same amount of fuel as in the tank on collection (normally full). Fifty (50%) will be charged on all refund fees. In case of neglect, tampering, loss or accident, the Hirer agrees to make the good necessary repairs or compensation up to a maximum of TTD 10,000.00 to be paid in full at least 72 hours after damages are done to vehicle. Deposit of TTD 1,500 payable in advance. The Hirer must be satisfied on spot that the car is in perfect working condition before taking possession of the vehicle. Hirer acknowledges and agrees that vehicle is the property of the operator and is to be returned on termination date and time specified or sooner if demanded by operator. Failure to do so may result in a penalty charge of a minimum of one day’s rental. Any person other than the hirer who is found driving the said vehicle, the vehicle would be seized by the owner or any person authorised by the owner and no monies refunded. Upon conclusion of the rental agreement, Renter shall pay in advance the amount specified for deposits on the reverse side; and upon the return of the vehicle, operator shall refund any amount paid in excess or if the advance payment is insufficient, Hirer shall pay operator the difference. Using the vehicle for freight transportation or similar commercial or carrier purposes, except for those uses commonly permitted by law. Allowing a third party not included under the stipulations of this agreement to operate and/or use the vehicle. Altering the original conditions of the vehicle by such means as rebuilding or refinishing any part of it. Using the vehicle for tests or competitions, or using it for towing, pulling or pushing any other vehicle. Overloading the vehicle beyond its specified carrying capacity, or operating vehicle on flat or insufficiently inflated tyres. Hirer shall promptly notify operator and submit without delay documents and any other effects that might serve as evidence as may be required by insurance firm contracted by operator. Renter shall not conclude with a third party any settlement agreement which may adversely affect the interest of operator without the consent of the latter. Renter shall promptly pay any fines or penalties imposed for parking violations, or any violation committed during the operation or use of the vehicle under the terms of this agreement. Renter must report all accidents immediately to local police and complete accident report. Renter authorises operator to possess a Credit Card Voucher (if applicable) in Renter’s name or charges. Renter is responsible for fuel and support to return car with the specific amount given. No refund will be made for any unused fuel remaining in the fuel tank at the end of the rental period. The minimum rental period is one day from morning to evening. Daily rates do not include fuel, local tax, personal accident and C.D.W. Full terms and conditions for reservations from Sheppy's Auto Rentals are available here. Rodriguez – means the vehicle rental firm shown on the front side, which is, where so indicated, an independent Licensee of Rodriguez Rent-A-Car System, Inc.
Renter – means the person(s) signing this Agreement, any other person or entity to which the charges incurred under this Agreement are to be billed, and any Additional Renter shown on the front side of this Agreement or otherwise permitted to drive the vehicle with the written consent of Rodriguez. Vehicle – means the motor vehicle described on the front side of this Agreement and includes all tires, tools, accessories, equipment, keys and vehicle documents in or on the vehicle. Rental Centre or Renting Location – means the Rodriguez location shown on the front side of this Agreement. RENTAL OF VEHICLE AND RESPONSIBILITY FOR PAYMENT. Rodriguez agrees to rent Vehicle to Renter subject to all of the terms and conditions on this page and on front side whether printed or written. All persons or entities who are by definition the Renter are jointly and severally responsible to Rodriguez for charges due under this Agreement. NATURE OF AGREEMENT/VEHICLE REPAIRS/WARRANTY DISCLAIMER. Vehicle is Rodriguez’s property. This Agreement is a contract only for use of Vehicle while Vehicle is on rental to Renter, Renter is not Rodriguez’s agent or employee, nor is Renter’s conduct under Rodriguez’s control, for any purpose. Any service to or replacement of a part or accessory to Vehicle during rental must have Rodriguez’s prior approval. Renter acquires no rights other than to use Vehicle in accordance with this Agreement. RODRIGUEZ MAKES NO WARRANTY OF ANY KIND, NATURE OR DESCRIPTION, EXPRESS OR IMPLIED REGARDING VEHICLE AND SPECIFICALLY DISCLAIMS ANY IMPLIED WARRANTIES OF MERCHANTABILITY OR FITNESS OF VEHICLE FOR ANY PARTICULAR PURPOSE. Rodriguez shall in no event be responsible to Renter for any indirect, special or consequential damages in connection with or arising out of furnishing, performance or use of vehicle. RESPONSIBILITY FOR VEHICLE CONDITION/RETURN/REPOSSESSION. Renter shall return Vehicle to Rodriguez in same condition as received, except for ordinary wear, to location where rented or to such Agreed Return Location as set forth on front side on the due date specified, but in no event more than 30 days after commencement of rental, regardless of due date specified. If Vehicle is not returned to such location by due date (or within thirty (30) days of commencement of rental, whichever is earlier). Rodriguez may repossess Vehicle at any time without demand, at Renter’s expense, if Vehicle is illegally parked, used for an illegal purpose, or apparently abandoned. Renter waives prior notice, pre-seizure hearing and receipt of judicial process as a prior condition to Rodriguez's repossession. Renter agrees that Rodriguez may notify the police or other authorities that the vehicle is stolen or missing, and Renter will not hold Rodriguez or the civil authorities responsible for their actions to repossess Vehicle, in any event of any Vehicle replacement for any reason. Rodriguez may, as its option, terminate this Agreement and rent any replacement Vehicle under the terms of a new agreement. THEFT. 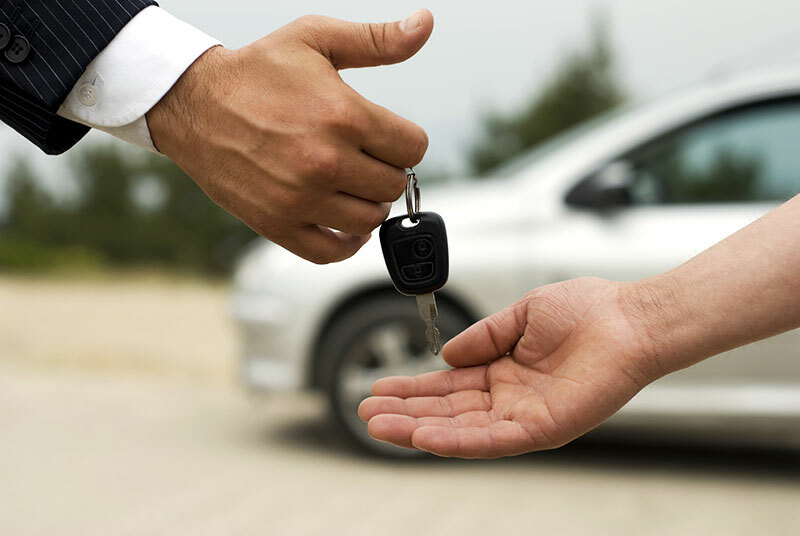 If Vehicle is used in accordance with all terms and conditions of this Agreement, Renter is not responsible for theft of Vehicle unless it is left unattended without all doors locked, windows up or keys removed. If Renter declines the Physical Damage Waiver at the time of rental by initialling the box labelled PDW DECLINED, Renter’s responsibility is limited to maximum amount set forth on front side. If Renter accepts Physical Damage Waiver at time of rental by initialling the box labelled PDW ACCEPTED, Renter’s responsibility is further reduced to the amount set forth on the front side. PHYSICAL DAMAGE WAIVER IS RODRIGUEZ’S WAIVER OF RENTER’S RESPONSIBILITY, IT IS NOT INSURANCE. IF VEHICLE IS USED BY PERSONS OTHER THAN RENTER OR ANY APPROVED ADDITIONAL RENTER, OR IS USED BY THE RENTER OR ANYONE ELSE IN VIOLATION OF THIS AGREEMENT, RENTER SHALL BE RESPONSIBLE TO RODRIGUEZ FOR ALL LOSS OF OR DAMAGE TO VEHICLE UP TO ITS FULL VALUE PLUS ANY INCIDENTAL RELATED COSTS INCURRED, WHETHER OR NOT RENTER HAS ACCEPTED PHYSICAL DAMAGE WAIVER. By anyone without first obtaining Rodriguez’s written consent. By anyone under age 21. By anyone who is not a qualified licensed driver. By anyone whose driver’s license in any state has been revoked or suspended within the previous 3 years, even if he or she now possesses a valid driver’s license. While under the influence of alcohol or other intoxicants like drugs or narcotics or under any other physical or mental impairment which adversely affects driver’s ability to operate the vehicle. On other than a paved road or graded private road or driveway. In an unsafe, reckless, grossly negligent, or wanton manner. Violating a traffic law or receiving a ticket in an accident is not automatically a violation of this provision, but may be an indication that a violation of this provision has occurred. PROHIBITED USE OF VEHICLE VIOLATES THIS AGREEMENT, VOIDS ALL LIABILITY AND OTHER INSURANCE COVERAGE (WHERE PERMITTED BY LAW), MAKES VEHICLE SUBJECT TO IMMEDIATE RECOVERY BY RODRIGUEZ, VOIDS PDW AND MAKES RENTER RESPONSIBLE FOR ALL LOSS OR DAMAGE TO OR CONNECTED WITH VEHICLE, REGARDLESS OF CAUSE, INCLUDING BUT NOT LIMITED TO RODRIGUEZ’S EXPENSES, INCLUDING LOSS OF USE. RESPONSIBILITY FOR PROPERTY IN VEHICLE. Rodriguez is not responsible for loss of or damage on property of the Renter or others left at any time in or on Vehicle or in the Rodriguez rental office, even if it is Rodriguez’s possession, regardless of who is at fault. Renter releases and indemnifies and holds Rodriguez, its agents and employees harmless against all claims made by others for such loss or damages. PAYMENT OF CHARGES. All charges and other amounts billed pursuant to this Agreement are payable by Renter (i) in cash at conclusion of rental, or (ii) if a credit card acceptable to Rodriguez is used, upon Renter’s receipt of applicable statement or invoice, in accordance with the terms of such statement or invoice, CREDIT CARD RENTER AUTHORIZES RODRIGUEZ TO PROCESS A CREDIT CARD VOUCHER, IF APPLICABLE, IN RENTER’S NAME FOR CHARGES AND CONSENTS TO RESERVATION OF CREDIT WITH CARD ISSUER FOR AN AMOUNT EQUAL TO ESTIMATED CHARGES DUE. For all rentals a credit card safety deposit is due upon finalization of the rental agreement. TIME AND MILEAGE CHARGES; Computed at daily/weekly or other rate set forth on reserve side (mileage determined by reading Vehicle odometer); charges are computed on the basis of 24 hour Rental Day, with extra hours’ rate set forth on reserve side charges for each hour and/or part of an hour in excess of a Rental Day before Vehicle is returned, until such hourly charges equal applicable daily rate. The minimum charge is one day plus mileage. REFUELLING SERVICE CHARGE; If Vehicle returned with less fuel then when rented, Rental shall pay for refuelling services as follows: If Renter does not purchase fuel during the rental, refuelling service charged shall be at rate set forth on front side, multiplied by miles travelled, as determined by reading Vehicle odometer, if Renter purchases fuel during rental, refuelling service charge shall be rate per gallon on front side multiplied by Rodriguez’s estimate of number of gallons required to refill Vehicle fuel tank (estimate made by reading Vehicle fuel gauge and using average of Vehicle manufacturer’s specified tank sizes for Vehicle’s car class). PHYSICAL DAMAGE WAIVER (PDW) CHARGES; If applicable, computed daily charge set forth on front side. Daily charge is due for each full or partial Rental Day. PERSONAL PASSENGER PROTECTION (PPP) and PERSONAL EFFECTS COVERAGE (PEC) CHARGE; If applicable, computed at daily charge set forth on reverse side. Daily charge is due for each full or partial rental day. These are optional insurance coverage. Certificate or summary describing benefits and exclusions is available at renting location. FINES AND OTHER EXPENSES; Fines, penalties, forfeitures, court costs and other expenses that may be assessed against Rodriguez which are due by reason of Renter’s possession or use of Vehicle, including traffic and parking lines. OTHER CHARGES; Drop-off and return mileage charges for drop-offs authorized at the time of rental; additional drop-off and return mileage charges, at the rate of $0.40 per mile multiplied by the number of miles from the rental location to the drop-off location (with a minimum additional fee of $50.00) if Vehicle is not returned to the Agreed Return Location; an additional charge of $8.00 for each hour the vehicle was rented if there is evidence that Renter disconnected or tampered with the odometer of Vehicle, or if the odometer is not working properly for any reason; and other charges; if applicable; for other services supplied by Rodriguez in connection with this Agreement. INTEREST ON PAST DUE AMOUNTS at the rate of 2% per month, which if not paid is added to the balance and subject to interest. ALL CHARGES ARE SUBJECT TO AUDIT. If, upon audit, an error is found, Credit Card Renter authorizes Rodriguez to correct such charges, including changing any charge card invoices signed by Renter, to reflect correct charges, with written notice or correction to Renter. THIRD PARTY LIABILITY PROTECTION. Anyone authorized by this Agreement to drive Vehicle is covered by an automobile liability insurance policy AGAINST LIABILITY TO THIRD PARTIES ONLY (NOT INCLUDING TO EXTENT PERMITTED BY LAW, ANY OF SUCH DRIVER’S FAMILY MEMBERS RELATED BY BLOOD, MARRIAGE OR ADOPTION RESIDING IN THEIR HOUSEHOLD), for bodily injury, death or property damage caused by or arising from use or operation of Vehicle as permitted by this Agreement. The amount of coverage provided under this Agreement is equal to the minimum financial responsibility limits established by the Financial Responsibility law or other applicable statute (“Statutory Limits”) of the state or other jurisdiction in which vehicle was rented. Protection hereunder shall automatically conform to basic requirements of any mandatory “No Fault” law which may be applicable, BUT DOES NOT INCLUDE “UNINSURED MOTORIST”, “UNDERINSURED MOTORIST” OR SUPPLEMENTARY “NO FAULT” OR OTHER OPTIONAL PROTECTION; AND RODRIGUEZ AND RENTER HEREBY REJECT, TO EXTENT PERMITTED BY LAW, INCLUSION OF ANY SUCH PROTECTION. In the event that coverage is imposed, by operation of law, for benefit of any person other than Renter then limits of such coverage shall be Statutory Limits of state or other jurisdiction in which accident occurred. Rodriguez warrants that to the extent permitted by law liability protection described in this Paragraph 10 is primary with respect to any insurance available to Renter. Renter and Additional Renter(s) hereby indemnify and hold Rodriguez, its agents and employees harmless from and against all loss, liability and expense whatsoever in excess of limits of liability protection provided for herein, as a result of bodily injury, death or property damage caused by, or arising from use of operation of Vehicle. PROTECTION IS VOID IN MEXICO. Renter must obtain Thrify’s written authorization and purchase liability and property damage insurance before entering Mexico. IF RENTER DOES NOT REPORT ACCIDENT TO RODRIGUEZ WITHIN 24 HOURS OF OCCURRENCE, LIABILITY INSURANCE COVERAGE DESCRIBED IN THIS PARAGRAPH IS VOID AND RODRIGUEZ PROVIDES NO LIABILITY INSURANCE TO RENTER UNDER THIS AGREEMENT. REPORTING OF ACCIDENTS AND PARKING OR TRAFFIC VIOLATIONS. Renter shall promptly report all accidents involving Vehicle to Rodriguez and, if necessary, to police. Renter and Additional Renter(s) shall deliver to Rodriguez all papers of any kind received by such party relating to any such accident. Renter and Additional Renter(s) will cooperate fully with Rodriguez in completing accident reports and in investigation and defence of any claim or lawsuit relating to any such accident and authorize Rodriguez to obtain from any government authority having jurisdiction thereof any record of any citation issued as a result of any such accident. PARKING AND TRAFFIC VIOLATIONS. Renter shall be responsible for any and all parking and traffic violation lines and penalties arising out of use or operation of Vehicle during the period of rental and agrees to pay or indemnify on behalf of the Renter, and to reimburse Rodriguez for all its collection and other expenses including attorney fees relating to same. Renter and Additional Renter(s) authorize Rodriguez in connection with claimed violations of parking or traffic laws arising out of use or operation of Vehicle by Renter and/or any such Additional Renter(s), to release to any governmental agency having jurisdiction thereof any information relating to Renter or any such Additional Renter(s) which Rodriguez has in its possession. ASSIGNMENT. This Agreement and Vehicle cannot be assigned or transferred by Renter. Renter remains responsible regardless of any attempted assignment. WAIVER/MODIFICATION OF TERMS/RELEASE. This Agreement is the entire agreement between Renter and Rodriguez. No other agreements, promises or responsibilities exist between Renter and Rodriguez with regard to this rental. No term or condition of this Agreement may be waived or modified as to Rodriguez except in writing, signed by a Rodriguez representative who has been expressively authorized to do so by Rodriguez. Renter acknowledges that this Agreement is between Renter and the Rodriguez entity identified on the front side. Renter hereby releases Rodriguez Rent-A-Car System, Inc., its agents and employees from any responsibility to Renter under this Agreement, and indemnifies and holds harmless Rodriguez Rent-A-Car System, Inc. from and against any and all loss, liability and expense whatsoever arising out of this Agreement or the operation or use of the Vehicle, unless Rodriguez Rent-A-Car System, Inc. is identified on the front side as the owner of the Rental Location. PROHIBITION BY LAW. If any provision of this Agreement is prohibited by law, it shall not affect the remaining provisions. Tobago's premier destination management service. We are noted for the very highest standards of professional, friendly and efficient service. "Yes" is the answer. What was the question?